Cindy and I got back from Lake Junaluska late Thursday night and had quite the full day on Friday. She caught up on sorting things around the house as we anticipate moving next year, since her time for doing this is running short because she knows the clock is winding down for school to start back. I spent the day having the car worked on, sitting in one of the dealership’s computer work stations typing up a bunch of Cabinet stuff. We had been at Junaluska for our Cabinet Retreat. It’s when we do a lot of team building and plan for the rest of the conference year. For United Methodists the new year started with our Annual Conference in June. Now is the bit of respite between set-up meetings for clergy and the start of Charge Conferences. After two wonderfully intense visioning days focusing on teamwork we got down to the nuts and bolts of the 2013-14 new conference year; composing the calendar that represents our life together and our common mission, deciding on this year’s Appointment Process; changes in Charge Conference forms; amendments to Cabinet Policies that cover everything from who pays for what in moving costs for clergy to Records Retention rules, and a whole lot more! As Cabinet Secretary I get to write and edit all this stuff, and for the most part I actually like it! After all, a part of me is a process kind of guy who likes order. But I’m also a dreamer who loves art – go figure. I love connecting the dots of our methodical process, and I feel that the covenant that holds us together is more of a creative thing than a rules thing. Being United Methodist is more a faith praxis (practice), or way of being, than a blind adherence to a set of rules in the most current Book of Discipline. You read it as much as I do and you start noticing the typos and mistakes. Try to figure out the official age of a young adult in the 2012 BOD (Paragraph 602.4). In less than five lines a young adult is defined as “between the ages of 18 and 30” and subsequently as “not younger than 18 and not older than 35.” So is it 19 to 30, or 18 to 35, and how much does it matter since we as a worldwide denomination have real different experiences of what that means? I used to care more about this stuff. I still notice and like the conundrums but the patterns and praxis of why we do what we do is much more interesting to me. Part of our retreat time included taking Myers-Briggs Type Indicator, and I came back as an an “ENFP.” Now, 36+ years ago when I came into UM ministry and had to take the MBTI as a part of my psychological testing, I was declared an “ESTJ” – an extroverted, sensing, thinking, judging person. But in looking at the differences through the guidance of this week’s facilitators, the ENFP label fits who I am better. I can see that during that time as an ESTJ, I’ve been someone who is outgoing, sensing the truth through empirical evidence, thinking things through, and a pretty critical judge of others and the facts — the kind of person who thinks and acts in a linear/literal sense and who loves rules! But now that I consider it, that’s the guy I turn(ed) into when I’m stressed, afraid, or insecure – something the expectations of marriage, fatherhood, and the church drew me toward. For a long time I felt like I had to work, work, work to prove my worth. Looking back, though, that isn’t who I was as a new Christian or where my heart has always been. So maybe everything we have been through in the last few years has brought me full circle to where God’s heart and mine have most easily intersected. I don’t feel like I have anything to prove anymore, and can just allow God to bathe me in life, family, faith, throwing clay, camping, and a little more “What-the-hecking-it” with a lot of stuff. Freedom! I can enjoy this wonderful gift of life and love and let go of fear of failure. Cindy and I can have a great time together, and be blessed by Narcie, Josh, and Caleb and their love and loves, and our grandchildren, of course! I would encourage you to retake the Meyers-Briggs or do it for the first time. It helped me get a perspective on things that I was feeling but couldn’t adequately describe. A half-drunk Congressman once staggered up to the table of the late newspaperman Horace Greely and said in a loud but slurred voice, “I’m a self-made man!” Greeley replied that he was glad to hear it, “for it certainly relieves God of a great responsibility.” Acting like or being something we’re not isn’t worth the trouble and it still exposes what we really are. All the cover-ups that we pull in overwork, name-dropping, and any other overcompensation are pretty darn obvious anyway. I truly resemble the remarks made about a man who was less than average in height, a little fleshy, and also bald. One day he and his wife were walking down a busy sidewalk when the guy turned to his wife and said, “Did you see that pretty young woman smile at me?” His wife replied, “Oh, that’s nothing. The first time I saw you I laughed out loud!” Thank you, Cindy, for not laughing at me too much, and for putting up with me anytime I tried to be somebody I really wasn’t. And thank God for God’s grace through Jesus, that gives love to us all! I haven’t blogged a few weeks and that says a lot about the limbo-land where our family has been. In the last month we have welcomed a new granddaughter and we have been with Narcie after another brain surgery. She describes it on her blog at www.narciejeter.wordpress.com. Where I am emotionally and theologically is an interesting place. We physically came back last night from Narcie’s, but our prayers and hearts are still there. We transition today from one night at home to going to the South Carolina Annual Conference Cabinet Banquet and one last prep time before AC starts tomorrow afternoon. As Parliamentarian I am trying to hone my skills so I can be of help, as if he needs it, to Bishop Jonathan Holston. How blessed we are to have him as our Episcopal leader! Where I am is twixt and ‘tween: not in Florida with Narcie and not quite mentally in South Carolina; not in Columbia and not yet in Florence yet for Annual Conference; not in summertime but almost; not at work but always working. It’s an emotional time clinging to the renewed hope that God and the doctors hold out, the time between MRI’s, chemo and radiation treatments; between Enoch’s birthday celebration yesterday and Evy’s dance recital today. It’s waking up and thinking, “Where am I?” I can’t even tell if I’m spent or rested. It’s almost an out-of-body experience. Too many of you have been exactly where I am and know how weird it is. Right? Is this our new normal, or, come to think of it, hasn’t life always been this way? This is why I haven’t written anything lately. What can you say or write when you’re at that hinge point between a life that was and a life that will be. Platitudes don’t cut it and I’m not much of a poet, so let’s just see what comes out. Here’s what I know: I should not worry about the unknown. I need to celebrate every day’s joys and accomplishments. I will not mope around. I will make plans to work and/or relax with purposeful intention. Most importantly, I will live each day with faith, hope, and love. Faith walks a path unseen, yet believed. Faith trusts in Jesus who is the “same yesterday, today, and forever.” Faith believes no matter what, God can work all things together for good. Faith is both a gift and a choice. God gives us the gracious ability to believe and it’s up to us to believe. Therefore, I choose faith! Hope is a little different. It is an expectancy of good. I’m not talking a weak hope, like hoping it’s going to rain without carrying an umbrella. Hope is a firm belief that God is good and does not and will not abandon us. If faith is my choice then hope is God’s choice. Hope isn’t about me turning on a switch or something. It’s about me accepting a calm but determined assurance that everything is going to be alright! This kind of hope is neither wishy-washy nor maudlin stupidity. It is a sincere trust in God’s best intentions for us. For me, Christian hope is a noun first that I get to turn into a verb through faith. Faith and hope sustain us. We should avoid the Charlie Brown attitude that says: “I’ve developed a new philosophy. I only dread one day at a time.” One way for me to fan faith and hope into positive expectancy is through love. Relishing God’s love through Christ empowers me to love others, even the unlovely. Love allows hope’s noun and faith’s verb to form a complete sentence: “Since God has good intentions for me (hope) and gives me the grace to believe (faith) then I will live like it through love.” Love conquers evil with good. Love is the evidence of faith and hope every time! What to do for us, for Narcie, for Josh, for Caleb – for me, Cindy, and maybe you – Stir what you got! Stir faith, hope, and love and see what happens! Episcopal elections are less than a week away and everyone is making their selections for their top 5 nominees for bishop. It is an interesting time as a nominee, and I desire your prayers for me and all the other nominees. Please pray also for all of the annual conferences that will receive new episcopal leadership and the SEJ Committee on Episcopacy that does the assignments. Pray for our current bishops who may or may not be assigned elsewhere, too. Good matches make for good ministry! I have no doubt about my call, but our system wisely confirms the calls of everyone from local church candidates for ministry all the way to bishops. You can’t self-proclaim God’s call in the United Methodist Church without holy conferencing and group affirmation! This year the process of voting will be different in the SEJ. We will have electronic balloting that hopefully will shave off a day from our schedule. There will be time to take breaks and conference/discern together, but, no doubt, things will be at a faster pace than we’ve ever seen before. The plan is for 16 ballots to take place next Wednesday and 16 next Thursday. Whew! Then next Thursday evening at 8:45 p.m. assignments will be announced by the Committee on Episcopacy and at 9 p.m. all the bishops will meet with members of their new/old annual conference at selected locations. Friday morning, July 20, will be the Consecration Service for the new bishops at 10 a.m.
My prayer is that we provide enough time and space in the process to listen to the Holy Spirit and each other. There’s the temptation to go to Junaluska with a slate of 5 based solely upon the election materials that have been sent out, nominee’s websites, mailings, their presentations at the SEJ D.S. meeting and at General Conference in Tampa. At Junaluska the nominees have 4 minutes to speak to the conference, then spend 10 minutes each with the delegations. We also have an opportunity next Tuesday night to speak to the SEJ racial/ethnic delegates. The issue of discernment is very important. Very often I base my decisions on pre-conceived notions or the limited exposure I’ve had with people. That can be misleading and lead to wrong decisions. So what I’m seeking is God’s will and looking for grace in the whole process. We, after all, are judging people! Is this person someone we want to elect, or is it another? Impartiality and fairness are often all that we ask from those who judge us. When we want someone to help assess our plans or point of view we hope they will be thoroughly objective. If we really want advice and not just someone who readily agrees with us, we must demand that we be given the truth, as much as it hurts. But, who is without bias? From one culture to the next, we have different and often opposing standards of what is acceptable. These opinions vary as much as families, schools, colleges, and churches do. Indeed, every institution, by its very nature, has its own set of prejudices. Every annual conference has its own character and culture, too. That’s not a bad thing. It’s reality. In some sense of the word, prejudices can be helpful. A pre-judged framework of values and customs sets the course of civilization and protects much that we hold sacred. One writer said it aptly, “Without the aid of prejudice and custom, I should not be able to find my way across the room.” An annual conference’s clarity about episcopal expectations can make transitions and expanded ministries more facile and attainable. But, as helpful as prejudices and customs are, should we Christians be that set in our ways? Shouldn’t we hate the word “prejudice?” It reminds us of past sin and pain in the separate and unequal prejudicial mistreatment of people. Someone has said that the older the prejudice, the hardier, so hardy that some can be considered perennials. Some prejudices keep coming back year after year, perpetuating ill will. To judge appropriately, whatever we do, we need to be very careful. So let’s be careful with one another next week. I trust the Lord and our means of conferring with the Body of Christ in our decision-making. This will be my last post before the balloting starts. May Jesus’ wisdom inform us so that we share the Mind of Christ. Thanks for your prayers and for a united bias for God’s will to be done. I was reading a candidate’s ordination papers the other day and started pondering how we’re made in the image of God. There are those that say the imago dei is best reflected in a legal or political way. That’s a sectarian triumphalist model that gives tacit, if not explicit, approval for humankind to exert dominion over creation. Drill, Baby, Drill – strip mine, do whatever you want to Mother Earth because it’s ours and God gave it to us. I don’t think this is how we’re best reflective of God’s image. In my reading of Genesis 1:26 it is about a God who calls Godself “US” that makes humankind in God’s image. “Us,” of course, implies plural. Now I know we don’t worship a multiplicity of gods. The Ten Commandments make it very clear that God is one. However, we also experience God’s self-revelation as Trinity. What a conundrum? Three persons yet one God? But how marvelous! When we see one member of the Trinity at work, we see all three. They are distinct but indivisble. Therefore, as I think about us being made in God’s image I see us clearly reflecting God’s social image. It’s simple. If God needs to dwell in the community that we call the Trinity how much more do we need to live and work together. We best reflect God’s image in community! Tomorrow we have our Clergy Orders meeting. I’m looking forward to it. Our speaker is going to talk about our denomination’s future. That will be good, but best of all we will be together as a covenant community: sharing stories, catching up, laughing, worshipping, and communing. The best Orders meeting that we have ever had in my 34 years wasn’t even an Orders meeting. This past Annual Conference we were having elections for General and Jurisdictional Conferences. The laity finished before us so only the clergy were left to continue balloting. It was late at night and everybody was walking around between ballots with some watching a baseball game piped in on the 2 big screens that we use at conference. Others were tossing frisbees. All of us were having a good time. The buzz was so positive, so real! It was one of the most significant times I have ever had at Annual Conference! Our whole society needs times like this when we just get together and move past the casual banter of chit-chat and actually fellowship with each other. Last week I went to our first home Gamecock football game at Williams-Brice Stadium. It was good to see longtime seatmates and catch up. We all got into the atmosphere. There were some new people around us. Maybe by season’s end we’ll share one another’s stories and get past the surface, “How are you?” Better yet, maybe what we need to do is take the band off the field at halftime and we’ll all go down there and meet each other, create a community that stretches from our private tailgating all the way to the hashmarks. World Communion Sunday is coming up soon on October 2. What a great day to lay aside the drudgery of formality and actually commune with each other authentically. Our celebration of the Eucharist will perhaps become a hearty “Thanks be to God!” because just like the Trinity we all need each other. Community is what gets us through the tough times, the tumors, and the transitions. Community is a megaphone for our triumphs, too. I’m looking forward to community wherever I can find it and make it. Annual Conference means different things to all of its members. Lay Members and clergy members of United Methodist Annual Conferences are indeed members, not delegates, of this uniquely Wesleyan entity. It’s hard to describe. Annual Conference is part homecoming, revival, political convention, and wrestling match. Wesley’s emphasis on humans being made in God’s social and moral image is the theological foundation for annual conference. If God reveals God’s self as Three-In-One, as a community that we call Trinity, then how much more do we need the interdependence or connection from the holy conferencing that is our opportunity at Annual Conference? Our distinctive theological core of transformation takes place because we’re not Lone Rangers. We’re part of something bigger, and it’s a place of accountability. When we get together we glad hand each other, but it is a distinctive place where we best reflect who God wants us to be. In accountability, mutual respect and community we look most like God. I know every family has its squabbles and Annual Conference does bring out that side of who we are. However, I pray that we will both speak the truth in love, and be loving enough to truly listen to one another. I pray that we will leave conference more united than divided and that’s not going to happen unless we love one another. This will be especially difficult this year. It’s an election year for delegates to our quadrennial meetings of General Conference and Jurisdictional Conference. It’s quite the affirmation to be elected to either of these bodies. General and Jurisdictional Conference elections aren’t a popularity contest. More than affirmation, they’re work. 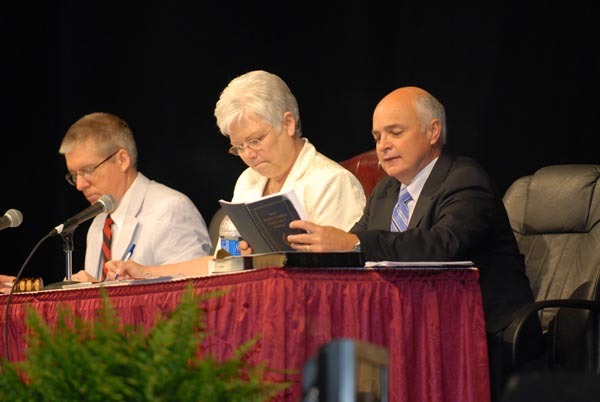 At General Conference we work on a new Book of Discipline and declare what we believe on sundry issues and what should be our best practices as a denomination. At Jurisdictional Conference we elect leaders: Bishops who will prayerfully do their best work in an Annual Conference and leaders who will serve on general boards and agencies. It is critical that we elect good bishops. You can have the best beliefs and declare how we think church should be, but bishops through their relationships have a lot to do with how those beliefs and visions are implemented. Bishops without leadership ability can derail all the best practices and ideas in the world. In his book Peck describes the stages of real community making. I daresay they are clearly illustrative of my experience of Annual Conference, and even General and Jurisdicational Conferences. Although these stages can progress in a linear fashion, there are stages that can be skipped over, revisited, or in which a group can be stuck ad infinitum. With that disclaimer, the first stage he describes is “pseudocommunity.” This stage is the “Hail Fellow, Well Met” fakey hugging reunion where everyone just smiles and refuses to take off their honeymoon grins. I know plenty of “church people” who would rather pretend their church never has problems than dare to take off their masks. Alas, honeymoons don’t last forever. Conflict-avoidance doesn’t do anyone much good in the long run. When individual differences are allowed to surface the second stage of “Chaos” is bound to follow. We all know too many churches and groups, even couples who thrive on chaos and can’t move past it. Thank God, literally, that there are few groups and churches that want to be in chaos forever. After chaos has run its course of rugged individualism, then comes “Emptiness.” Emptiness is “soft” individualism. One isn’t absorbed by the group in a hostile takeover. Differences are celebrated rather than castigated. Emptiness is that emotional place that Jesus modeled so well. It’s a place where soft quietness descends. By this I don’t mean a passive quietism that values submission more than authenticity. It’s a good submission that holds to one’s core values, but honors the other/the common good as more important. “Emptiness” is a poor descriptive word, at least in our contemporary context. It sounds too negative, like a giving in more than a giving up. True community isn’t noted for its repressed desires that the word “emptiness” conjures. True community makes me think of the word, “peace.” It’s a place where we can all be at peace, hold onto our own individuations yet work together for our common existence and a shared positive future. A few weeks ago several Columbia District clergy and I went to Mt. Mitchell and fellowshipped. 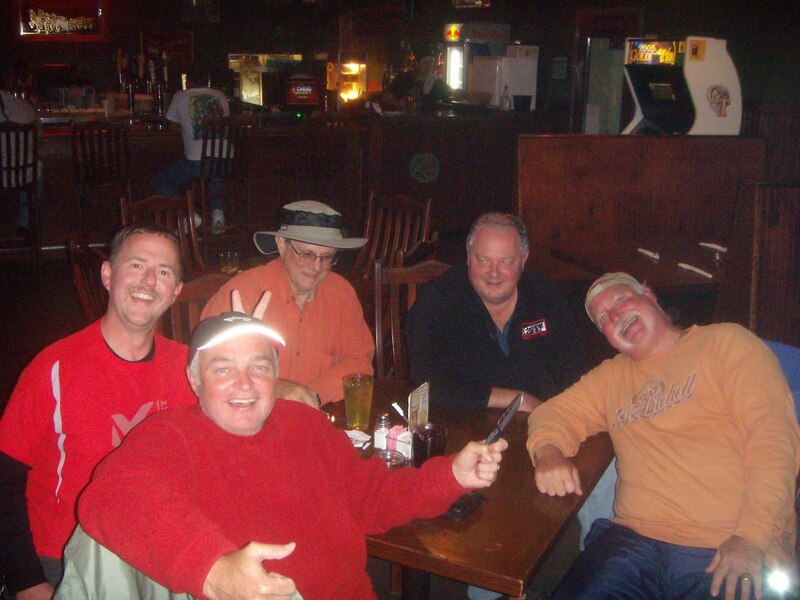 We even went down the mountain for Thursday Night College Football. How we got back in the gate at the park is another story, and one worth telling sometime. We needed that time together sharing and having fun. Unfortunately, our life together has low moments, too. I just came back from a hospital room as proof. However, I just saw our covenant community as clergy in action again. One of the pastors in my district just found out that he has acute leukemia. Tomorrow he starts 24/7 aggressive chemo. We’re not at all sure about the prognosis. I spent time with him and his wife last night and again today. Their faith is strong, but they are shell-shocked. I have been working with his church since last night to cover the ministry needs, and I hope the church rallies around him. It has been a tough appointment, not because the people are unChristian. They are wonderful, but they are still grieving the moving of their former pastor of 13 years. That has brought out the usual grief-related potshots at the current pastor, and the adage “Don’t let worry kill you, let the church help” has been too true in this situation. My prayer is that healing comes to the pastor and the church. At the hospital a few minutes ago another one of our clergy came into the room with Bible and Communion elements in hand. He read poignantly from Psalm 20 – Read it! I have never felt the power of those words of comfort so eloquently read. I gave the Great Thanksgiving and we communed in a way far deeper than I have experienced the sacrament in a long time. When United Methodist clergy start our ministry our membership is transferred from our local church to the Annual Conference. The Annual Conference becomes our church home. I saw it today and I am wonderfully encouraged. May God grant us all a support community where we find sanctuary. Amen.